Facebook earnt more from advertising in a quarter which saw it take over from Twitter as the best social network for news sources, according to a global analysis by TBG Digital. The analysis shows an increase of 41% in cost per thousand impressions (CPM) since quarter one, 2011, indicating how much Facebook earns per ad served. Cost per click (CPC) prices have increased by almost 25% since last quarter with the biggest increase in France (35%) followed by the US (20%). The ‘Global Facebook Advertising Report Q1 2012′ credits the increase to an unbalanced supply and demand, speculating that growth in new users may be slowing while the social network becomes more attractive to advertisers. The average click through rate (CTR), a measure of how engaging users find the ad, either remained steady or declined slightly across they major territories analysed in the 190-country study. Responsible for this is an increase in the number of ads displayed per page, which Facebook has increased to up to seven at a time, according to the report. However, certain categories performed better than others, with news leading the pack, notching a 196% increase in CTR since quarter four 2011. “Twitter is no longer the social network for news,” the report reads. “With the huge success of Facebook social readers from the likes of Yahoo! News, The Washington Post and The Guardian, we have seen a strong uplift in CTR for those in the news sector since quarter four 2011. 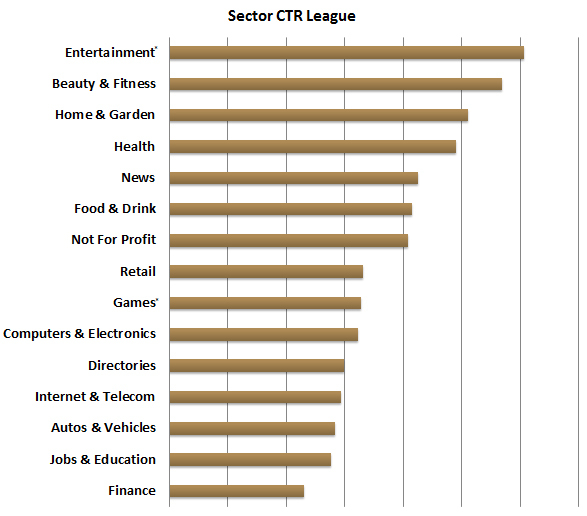 The entertainment category still sits on top of the CTR league, replacing food and drink which fell five places. Beauty and fitness, home and garden, health and news round out the top five categories by click through. The report puts the strong performance of fitness down to seasonal deviations with the category traditionally a big focus to start the new year. Finance, which took the bottom spot, experienced a CTR three times below entertainment, showing the disparity between the top and bottom placings. Impression-wise, retail dominated, taking 23% of all impressions, an increase of 10%, as retailers begin to use Facebook as a discovery tool and as a way to communicate new products, seasons or sales. 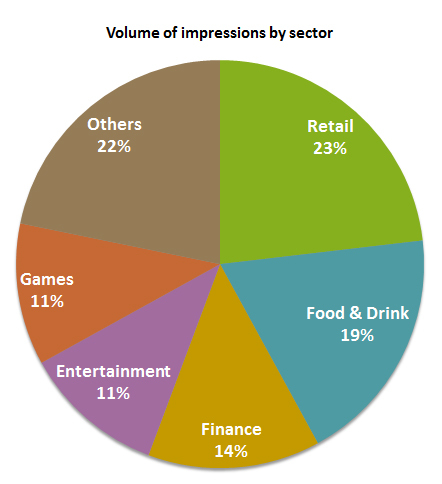 Together, the top five categories by impression make up 78% of all impressions served in the eighteen sectors measured. The benefits of ads keeping click-throughs to stay within the Facebook environment solidified over the period. Finance ads, which sent 91% of traffic out of the Facebook environment to sign up for services, notched the most expensive advertising costs, 3.5 times higher than the food and drink sector which has the lowest ad costs. For food and drink sector, Facebook is being used primarily as a branding tool, with only 4% of traffic sent offsite in quarter one 2012, taking advantage of the incentives Facebook pays to keep traffic onsite. Advertisers are offered CPCs of up to 45% less for ads that keep users within the Facebook environment. The report also notes that brands will have to work harder to recruit fans in the future, as competition for attention increases driving up costs per fan. In the first quarter of the year, cost per fan increased 43% across all territories, with the greatest jump coming in the UK at 77% followed by the US at 37%. No break down was provided on the performance of Australian advertising.